Jan Engert speaks about collaboration between managers and scientists working for the United States Forest Service. On both the federal and local level, leadership has been heavily emphasized in the context of climate change, particularly when working with forests and grasslands. The question encompasses all the main issues accompanying climate change. First of all, the extent of uncertainty regarding climate change needs to be addressed both within the population of managers and employees and the United States public. 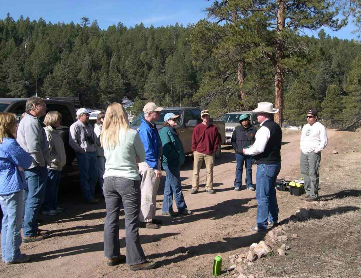 In order to educate people about the issues that accompany climate change, the Rocky Mountain Research Station held “Science Days” to promote ongoing dialogue between managers and scientists. Scientists and mangers worked together to identify policy and management needs as well as review the basics of climate change. After the climate change 101, managers learned about the impacts it will have on natural resources, wildlife, vegetation and fisheries. Scientists and managers together outlined possible solutions at the local level, based on resources available. The workshops overall educated managers on the basics of climate change and scientists on what will need to be done in the future regarding climate change adaptation.